Municipality of Platanias 74.932 of sq meters and has a population of 5225 residents.It covers 13 villages and hamlets on the north coast of Chania region. The villages that became muncipality of Platanias in 2000 are: Gerani, Maleme, Kontomari, Vrises, and Syrili. Today Platanias is one of the wealthiest and more popular countys of Chania. It is 20 minutes from the interantional airport of Chania and 30 minutes from the harbour. During the summer period is the most busy area in Chania and thousands of tourist visit it from around the world. Platanias is a combination of a busy lifestyle but also a relaxing place. Gerani is located 14.5 km west of Hania. The local people call it Pano Gerani in order to distinguish it with the coastal settlement of Kato Gerani located one kilometer to the north. The village is mentioned at the census of Fr Barozzi in 1577 but his history is believed that starts centuries ago while some (E.Lambrinakis) claim that here was the exact location of ancient Kydonia and that a temple of VRITOMARTIS used to be here. A cruel battle took place at Gerani between the Turks and the Cretan revolutionists in 1867. 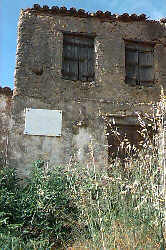 Ioannis Papadogiorgakis the famous revolutionist (hainis) renowned as "GERANIOTIS" where born here in 1798. Modi is a beautiful small village located 15km west of Hania at 80m a.s.l. near the village of Gerani . Ancient Cretan coins were found here depicting on one side the head of Zeus and on the other that of a bull with the inscription "MODAION" which means coin of the people of MODA or MODEA. That make some to believe that an ancient city stood here with the above name which was maintained until today as Modi. Many other findings tombs, weapons etc were unearthed to confirm the claims of the archaeologists. 20 km west of Hania at 120m a.s.l. Maniliopoulo is a picturesque village built among huge trees. It is the seat of the municipality of the same name and is firts mentioned at the egyptian census in 1834. Loutraki is located 17 km away from Hania and 2km from Gerani at 70m a.s.l. with 150 permanent residents and is part of the municipality of Gerani . It is mentioned at the censusws since 1577. 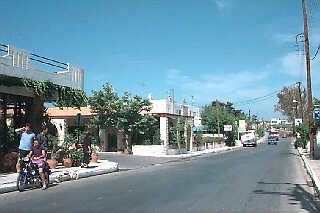 Vrisses a village located 16km from Hania, 4 km from the central road Hania Kissamos to the left. Seat of the municipality of Vrisses is mentioned since 1577.